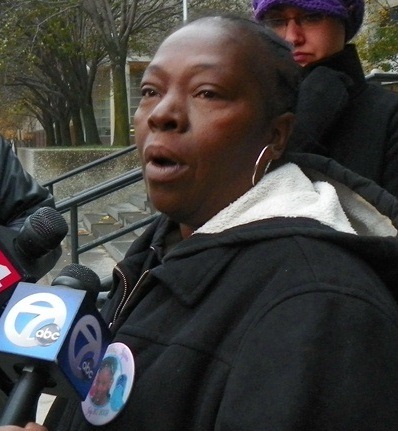 Mertilla Jones at press conference Oct. 29, 2012, demanding trial for Joseph Weekley. Continued protests eventually forced him to court. DETROIT – Her face worn with the grief of four years since her grandaughter Aiyana Jones was shot to death in front of her by Detroit police officer Joseph Weekley, Mertilla Jones braved an onslaught of attacks, finishing her testimony in Weekley’s re-trial Sept. 30. She appeared to use every iota of strength to retain her composure under defense attorney Steve Fishman’s hostile cross exam. 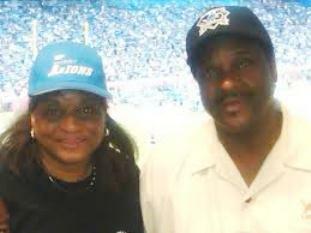 Judge Cynthia Gray Hathaway with husband, Wayne Co. Deputy Sheriff Dewayne Hayes. She was formerly married to Judge Michael Hathaway but kept the popular Hathaway name. Michael Hathaway sentenced reporter Diane Bukowski in 2009 on trumped-up charges for doing her job as a reporter for the Michigan Citizen, at the scene of a state trooper chase that ended with the deaths of two Black Detroit men. He granted a prosecution motion to ignore Bukowski’s First Amendment rights. The prosecutor in the case, Thomas Trczinski, died of a massive heart attack Dec. 24, 2013 at the age of 56. About a dozen Jones family members, friends and supporters attended the trial that day, unlike the previous day when police officers and their families took nearly every available seat in the courtroom. Hathaway had denied a defense motion for a mistrial the day before after polling jurors about their reaction to Ms. Jones’ testimony Sept. 24, during which she broke down, tearfully begging Weekley to tell her WHY he had come into her house and killed her seven-year-old granddaughter. Jurors said they could still render a fair verdict. Defense attorney Steve Fishman claimed her breakdown was “premeditated and deliberate” in asking for a mistrial. 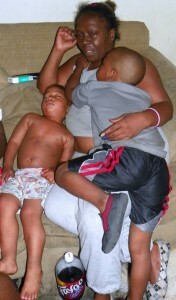 Aiyana Jones with little brother Carlos in happy years. Ms. Jones said the SRT team went through the house rousting out the sleeping members of her family, ordering them to come to the front room. They told her to sit on a second couch with her sister JoAnn Robinson. Ms. Jones said she asked permission to get her medication, but that she never got a chance to take it because plainclothes officers asked her to step outside. When she did, she testified, they told her she was under arrest and handcuffed her behind her back. 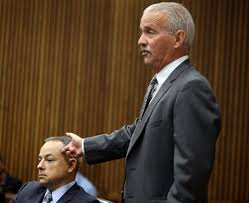 Defense attorney Steve Fishman repeatedly mocked Ms. Jones’ allegation that Weekley put his gun to Aiyana’s head, as he demonstrates here with Weekley. Wayne Co. ME Carl Schmidt’s testimony, however, left that possibility open, saying a contact gunshot would not leave stippling. Fishman said the lack of stippling was evidence of no close-range firing, He repeatedly used the word “assassinated” which Ms. Jones never used. Judge Hathaway later granted a defense motion to suppress the introduction of that statement, given five hours after Aiyana’s death, as well as the police video of the interrogation. Fishman then began cross exam. “Your demeanor is a lot different today, wouldn’t you agree?” he asked. “You intentionally created that scene [Sept. 24] on purpose, didn’t you?” He referred to previous occasions on which she testified and had not broken down. Since Ms. Jones’ previous testimony, Aiyana’s father Charles Jones was convicted of second-degree murder in the death of JeRean Blake, despite his acquittal of the gun charges on which the murder charge was based. He was sentenced to 40-60 years in prison. Two of Ms. Jones’ sisters, including JoAnn Robinson, present during the police incursion, have died. Ms. Jones told VOD that police repeatedly targeted the family, arresting and eventually releasing several young male members as well as her daughter LaKrystal Sanders. She said they repeatedly drove by the family’s new address, shining lights inside her windows. In May, 2012, police attempted to raid their house again near midnight, which VOD reported in a separate story after going to the scene immediately. She said she and her daughter LaKrystal Sanders had experienced repeated bouts of serious illness. Sanders told VOD that she now sleeps on the couch by the window at a new location, so she can watch her mother on a second couch. She said her mother continually wakes up during the night in anguish. “Of course I was angry,” Ms. Jones replied. She affirmed some of the quotes and said she was otherwise misquoted. “And you don’t know anything about my background,” Ms. Jones responded. Ms. Jones graduated from Detroit East Catholic High School in 1980 and has an extensive extended family living in Detroit. She attends church at activist Pastor Willie Rideout’s All God’s People Ministries in Detroit and had met with him the night before. 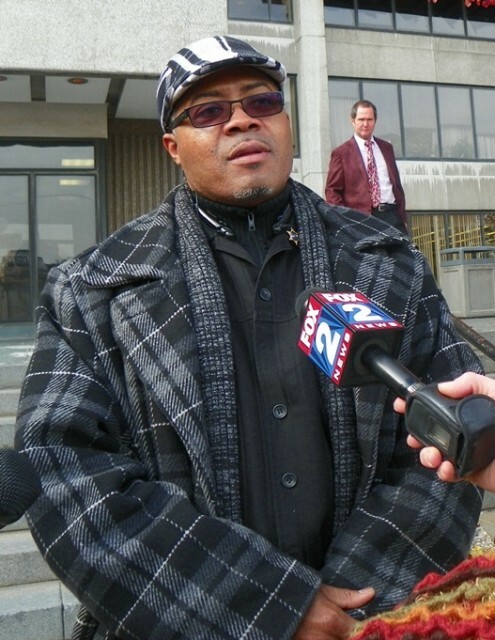 Police brutality activist Ron Scott, also present, said that prior to the tenure of former police chief Warren Evans it had not been the policy of Detroit police to execute search warrants in such a militarized fashion, that they normally knocked, said they had a warrant, and asked the subject to come out before forcing entry. 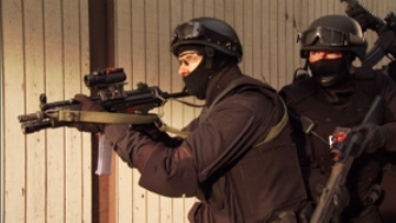 Detroit SWAT team officers in battle dress uniform. Their eyes are not covered. Fishman then told her she didn’t know that the Medical Examiner had testified that Aiyana wasn’t shot at close range because there was no gunpowder stippling around the wound, mischaracterizing the ME’s full statement. 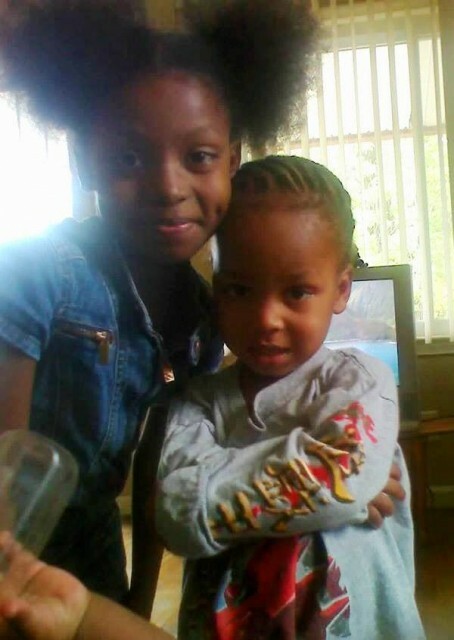 As VOD reported earlier, Wayne County Medical Examiner Carl Schmidt added at the conclusion of his testimony that if the gun’s muzzle was directly against Aiyana’s head, there would have been no stippling. Asst. Prosecutors Moran and Mark Hindelang raised no objection, although Moran earlier confirmed to VOD that Schmidt made the statement. Fishman grilled Ms. Jones about her statements that Weekley showed no remorse. “You said you could see his eyes, and that he didn’t look remorseful after he assassinated your granddaughter,” Fishman said. Ms. Jones told him that was correct, and that even though Weekley was wearing a mask she could still see his eyes. A police officer later displayed “battle dress uniforms” worn by SRT members. They include a “balaclava,” a black knit hood with eyeholes, and a mask which still leaves the eyes exposed. 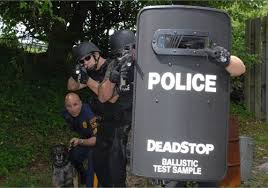 Weekley carried a ballistics shield, the only time his eyes would have been covered, but another officer testified later the shield is to be dropped after safe entry into a location. Fishman then queried Ms. Jones about the presence of other family members in her flat as well as the flat upstairs, where her daughter and Chauncey Owens, convicted in the killing of JeRean Blake, lived. She said her sons Vincent and Dazmond Ellis and Charles Jones were living with her at her address at the time, as well as her sister JoAnn Robinson and her sister’s two grandsons Mark and Markwell Robinson. She said Charles’ fiancée Dominika Stanley and their four children, including Aiyana, were also visiting for several weeks. 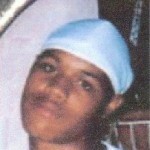 Ms. Jones denied knowledge of the killing of JeRean Blake at the time it took place. Although the daily media has reported since three days after Aiyana’s death that Owens said Charles Jones gave him the gun that killed Blake, police videotape of Owens’ testimony at their trial showed him naming another individual. No court records show that Owens ever named Jones. Asst. Prosecutor Robert Moran in front as Charles Jones’ defense attorney Leon Weiss questions witness during Jones’s preliminary exam in 2012. Moran is the prosecutor in both the Weekley and Jones cases. Without objections from the prosecution throughout the cross exam, Fishman continued to grill Jones about her alleged hatred of the police, to which she replied that she has police officers in her family and does not believe they are all bad. Fishman implied that several family members had said that Jones told them she didn’t see the shooting. On rebuttal, Moran said that she never testified that she didn’t see the shooting, and that she told police from the beginning that she had. It was at that point that Hathaway granted Fishman’s motion to exclude Ms. Jones’ written and videotaped police statements from the trial to remedy the effects of Fishman’s attempted impeachment. Fishman called her statement to the police “hearsay.” Hathaway said the written statement itself was not significant. Fishman repeatedly used the word “assassinated” with respect to Jones’ statements regarding the killing of Aiyana. However, she herself has not used that word in either of Jones’ trials. 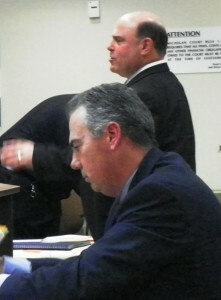 Markwell and Mark Robinson then testified. Mark Robinson said he had just gotten up to round up two puppies who had escaped from the yard when the SRT team pulled up. He said the police then threw the flash bang grenade through the window and that he heard what sounded like a gunshot directly afterwards. On cross exam, Robinson said he had heard of the shooting of JeRean Blake May 15 and suspected Owens might have been involved. He also said when the police came, he suspected that’s why they were there. SRT member Corporal Larry Davis testified he threw the stun grenade through the living room window. He identified where he was standing on the porch at the time from a photo, indicating that he was standing right next to a “Little Tykes” child’s chair on the porch. Davis said during a previous raid, his military-style vest saved his life when a gunman opened fire when he entered the house as “point man,” [first in the doorway]. SRT member Trent Brown, who said he served in the Marine Corps for four years, testified that his training there and with SRT, along with the “camaraderie” displayed among members, were very similar. He testified extensively regarding the weapons training he underwent, including weapons retention, and keeping his index finger off the trigger, on the slide of the gun pointed straight ahead. Testimony Oct. 1 opened with that of SRT members Bibbs and Kata-Ante Taylor, most of which VOD missed. Taylor testified during VOD’s presence that he was the officer who had rushed Aiyana to the hospital, accompanied by an officer trained as a medic and Sgt. Bibbs. 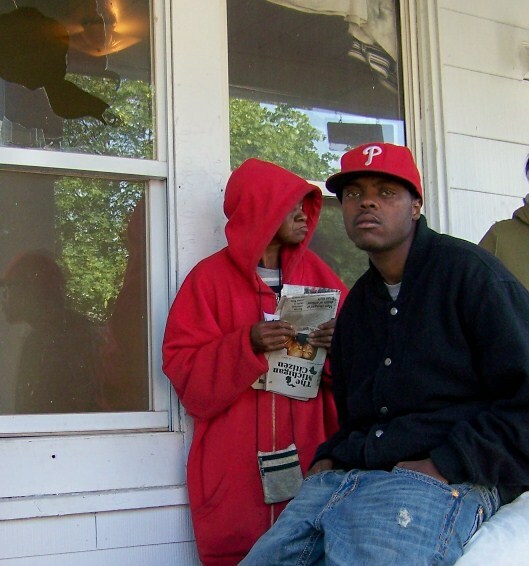 Taylor is also the officer who shot 18-year-old Artell Dickerson to death in the back, as he lay already wounded next to the Cantrell Funeral Home in 2008, according to testimony from two eyewitnesses. Dickerson’s family was awarded $1.5 million in a settlement. SRT Sgt. Supervisor John Robert Collins then took the stand. He appeared to be still grieving over Aiyana’s killing. “I’ve never been the same since that night,” he told Moran. He testified he heard one gunshot round go off almost “on top of” the explosion caused by the stun grenade. “When the gunshot went off, there was a delay of time,” Collins said. He testified he then saw SRT officers carrying a child from the house running very quickly. 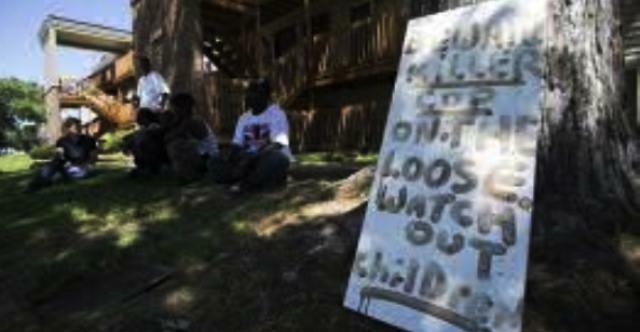 Then, he said, Weekley exited the house and approached him on the porch, grabbing at HIS gun. Collins’ response as he described it was in keeping with SRT training. Raid team leader Timothy Dollinger shown as star of A & E’s Detroit SWAT. He said he took Weekley back to an SRT vehicle, and took his MP5 and .45 caliber revolver from him, standard operating procedure in an officer-involved shooting. He said he “made the weapons safe” first. SRT member Timothy Dollinger, just promoted to Captain before retiring in July after 20 years with DPD, 17 of them with the SRT, testified next. Dollinger said he was in charge of SRT tactics that night. These are the same toys shown in a surveillance photo taken the day before the raid on the Jones home. He said it was his job to surveill the location first to determine the correct address, identify traffic in the area, impediments to entry, and the presence of “children, dogs, and seniors.”Dollinger said he and Officers Bibbs, Stollard, and Weekley drove by the residence sometime between 9:30 p.m. and 12:50 p.m., likely an hour before the raid. He said the team drove by quickly, and “might not have had” camera equipment with them, so they did not take pictures. He said he could clearly see the addresses of both flats but did not see any children’s toys. 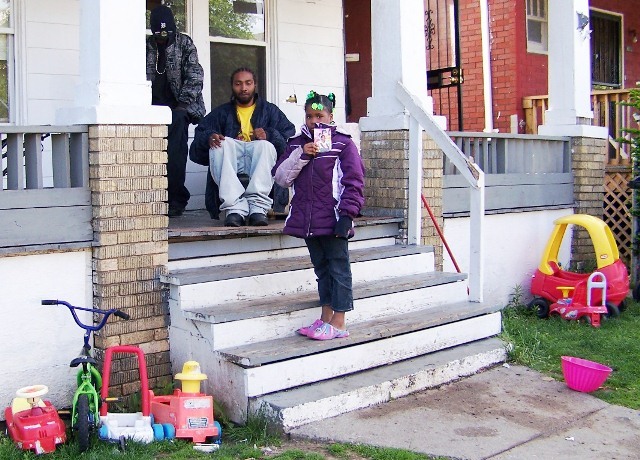 Moran showed him a photo taken earlier in the day by another surveillance team which showed numerous brightly colored children’s toys in the front yard on either side of the porch, but Dollinger again denied seeing the toys, as have most of the SRT team members who have testified so far. On cross exam, Dollinger said the presence of children in the house would not have stopped execution of the search warrant. 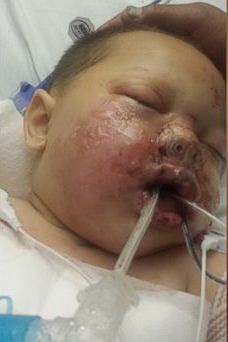 He said a stun grenade could still be used unless there were children under “one and a half years” old in the house. In May of this year, a Georgia SWAT team tossed a stun grenade into the home of a suspected drug dealer where a family with five children was temporarily staying. It landed in the crib of infant Bounkham Phonesavanh, 19 months old, severely burning him and forcing the hospital to put him into a medically induced coma, fighting for his life. His family has since asked for a Justice Department investigation. The Georgia SWAT team members expressed shock and remorse, unlike Dollinger, who remained impassive throughout his testimony. On Oct. 2, 2014, Judge Cynthia Gray Hathaway banned this reporter from the courtroom for the rest of the trial due to an alleged noise she made during Dollinger’s testimony about the 18-month-old age limit for stun grenades. She had originally told her she could stay, but defense attorney Steven Fishman and evidently some members of the media, including the Detroit News’ George Hunter, complained to Hathaway, who changed her mind. Hunter even ran an article in the News about this momentous event, during which he tweeted that “everyone in the media” knew who made the noise, and raised the issue of Bukowski’s arrest in 2008 in violation of her First Amendment rights, as she took photos for the Michigan Citizen of the aftermath of a fatal state trooper chase. Numerous government and community leaders and even four major media stars joined her defense team at the time. In his tweet, Hunter admitted he had mistakenly reported that Mertilla Jones’ fingerprints were on Weekley’s gun, which was not the case according to testimony from a crime lab official, who said near Jones’ DNA nor fingerprints were on the gun. He also erroneously reported in an earlier story on this trial that police had a warrant for Charles Jones when they made the raid, a notion that other media outlets have run with. During this trial, the only evidence about a warrant has been that with Chauncey Owens’s name on it. But so much for corporate media support of the police and another violation of Bukowski’s First Amendment rights. Livestream video of the testimony today showed Officer Shawn Stallard on the stand. He was the second team member into the home after Weekley, and he testified again, as he had at the first trial, that he did not see Mertilla Jones struggle wlth Weekley, although he was looking the other way at first. The prosecutor asked, “Did you see anyone jump up and grab his weapon?” to which he responded “No.” Asked if he heard Weekley tell anyone to get off his weapon, he again responded no. Detective Sgt. Tawanna Powell, head of the Michigan State Troopers’ investigative unit regarding police shootings, public corruption, and other matters, also testified about her entensive review of the evidence in the case. She said she did not access it until that Monday morning, July 17, but thereafter reviewed and handled all crime scene evidence in the case. Regarding Weekley’s allegations that Ms. Jones grabbed his gun, she said that Ms. Jones was never charged or arrested for the crime of disarming or interfering with a police officer. The afternoon of the trial was spent at an undisclosed location so the jury could observe the use of a stun grenade in a privately-owned property in Detroit. See video from Channel Four News below. The video also shows Weekley as he was dressed the day of Aiyana’s killing, with his eyes completely visible.